It’s been a while since we featured a fun cake topper so today’s the day! Even though I really love the idea of a “traditional” (read: old fashioned) cake topper with little figures of the happy couple on top of the cake, I’m also open to a more modern and fun cake topper. If you’re a fan of fresh flowers on cakes I’m all about using blooms as a cake topper. But I really, really love these acrylic cake toppers like the one I’m featuring today. 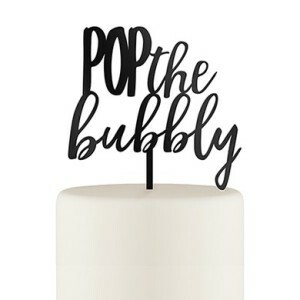 This “Pop the Bubbly” cake topper is so much fun! And it’s perfect for the happiest day of your life when you’re going to be popping a lot of bubbly! The cake topper is available in black or white – which means it’ll match just about every cake design. You can find this cake topper here.